Contents: Considerations of Equity in International Environmental Politics: Introduction: environment, equity, and U.S. foreign policy; Defining international environmental equity; The earth summit and international equity; A history of international equity in global environmental politics. 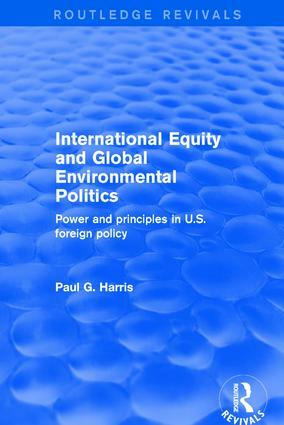 International Environmental Equity and U.S. Foreign Policy: America’s response to evolving themes of international environmental equity; International environmental equity and U.S. national interests; International environmental equity and American politics; International environmental equity and altruistic principles. Equity, U.S. Foreign Policy and the Future of Global Environmental Politics: International equity and global environmental change: implications for American foreign policy and humankind; Conclusion: international environmental equity in U.S. foreign policy; Index. Paul G. Harris is Chair Professor of Global and Environmental Studies at the Hong Kong Institute of Education, where he is also Head of the Department of Social Sciences, Senior Research Fellow in the Centre for Governance and Citizenship, and a member of the Department of Science and Environmental Studies.